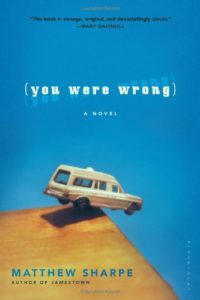 You Were Wrong is a short book, but manages to wear out its welcome in no time at all. I was ready to throw it against the wall after two chapters, but forced myself to continue reading so that I could finish and give it a fair review. The good news is that I got used to the writing style after a few more chapters, but the bad news is that I think that may have just been Stockholm Syndrome in action. The main character, Karl Floor, is a sad-sack twenty-something math teacher who shares his dead mother’s house with his hateful stepfather. When the book opens, Karl is beaten up by two of his students, only to stumble home and discover that his house is apparently being robbed by the beautiful and mysterious Sylvia Vetch. Sylvia doesn’t act like a normal robber, however, and tends to Karl’s wounds before taking him on a journey across town to the house where she lives. As Karl’s life becomes intertwined with Sylvia and her circle, he wanders aimlessly through a series of mysterious encounters with people who abuse and confuse him. Karl is entirely passive by nature, and spends most of the book whining, getting dragged along against his will, or just plain lying down and passing out. The book feels a bit more like a series of rambling vignettes than a novel. There is the slightest hint of a mystery concerning Sylvia’s real motivations, and the story almost swerves into crime fiction at one point before course-correcting, but mostly it’s a shambling collection of long-winded character studies. Sharpe describes the most mundane of things in excruciating detail, often employing digressions within digressions that bloat single sentences into page-long tangents. Characters don’t speak like actual human beings; either they monologue for pages about vaguely related matters, or they utter terse exchanges full of thudding importance and implied mystery. The best I can say about the book is that Sharpe occasionally pulls off a fine turn of phrase or throws in a decent joke. For the most part, however, I found it both overwritten and crashingly dull, and was glad to see the back of it.